PTCL brings the amazing "Smart TV Jadoo Plus" to the Nation on the auspicious day of 23rd March. 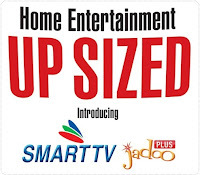 Smart TV Jadoo Plus is a new variation of Smart TV service. Smart TV Jadoo PLUS shall be a big source of entertainment for PTCL's customers. This product will provide customers with 125 channels stream (IPTV multicast stream). More over it will provide PTCL's customers with millions of videos and a huge library of free Movies. It also provides App store facility, through which PTCL's customers shall be able to use internet applications on their television sets. All the existing and new PTCL customers can avail this facility. PTCL Broadband is required for Smart TV jadoo Plus. The Smart TV Jadoo Plus device upfront charges are Rs 10,000. Subscription fee of Smart TV Jadoo Plus is PKR 600 per month. There are no installation charges for Smart TV Jadoo Plus. The warranty period of Smart TV JadooPlus Device is One year. High speed internet access with 2Mbps or higher speed is required. A TV with composite or HDMI input support. Ability to connect the Smart TV Jadoo Plus in wired manner with the internet router / hub. The Smart TV Jadoo Plus supports both composite (1 video + 2 audio) and HDMI inputs. Note: At least 2 Mbps PTCL Broadband connection is required for proper operation of Jadoo Plus. Smart TV Jadoo Plus kit includes Ethernet cable, composite A/V cable, HDMI cable, power adaptor, remote control (with batteries) and Easy Set Up guide.